If you look at the nine 2016 Oscar nominees for Best Picture, the biggest commercial hit may come as a surprise. A fairly small character piece, Hidden Figures turned into a sleeper attraction and became the highest-grossing film of the nine nominees. Perhaps this occurred because Figures also offered arguably the most conventional production of the nine. A prologue set in 1926 introduces us to Katherine Coleman (Lidya Jewett), a young African-American girl who shows remarkable mathematical skills. From there the film jumps to 1961, where adult Katherine (Taraji P. Henson) works at NASA as a “computer”. This means she does mathematical computation by hand, and her friends Dorothy Vaughan (Octavia Spencer) and Mary Jackson (Janelle Monáe) perform the same tasks. With the “space race” in full bloom, Katherine’s enormous talents land her as part of the Space Task Group under director Al Harrison (Kevin Costner). The first African-American of either gender to serve in this organization, Katherine goes against sexism and (mostly) racism. In addition, her friends fight their own battles. Dorothy wants to get a promotion to supervisor, while Mary hopes to get the training to become an engineer. We follow the paths all three women take as they deal with the realities of their society. I find it easier to criticize some movies rather than others, and Hidden Figures becomes one I feel loathe to knock because it’s just so darned well-meaning. The film tells an important story and it does so with heart and conviction – how can I possibly find fault with it? Because for all that heart and conviction, Figures offers a completely “by the numbers” effort. While it does almost nothing overtly wrong, it presents the kind of superficial “message movie” we’ve seen 10,000 times already. Let’s make no mistake: I like that “message”. As I noted, I think Figures relates a story that deserves a broad audience, and it does so in a manner that boasts a respectful tone. We feel the struggle and injustice experienced by the lead characters. Unfortunately, we rarely get a sense of Katherine and the others as real human beings, and far too much of Figures feels trite and predictable. Everyone speaks in scripted sound bites and slogans, without much that would qualify as realistic dialogue. Going into the film, I assumed Disney released it and Jerry Bruckheimer produced it. Figures reminds me an awful lot of civil rights-related dramas such Remember the Titans and Glory Road, efforts that came from those sources. Nope – neither Disney nor Bruckheimer had anything to do with Figures, but the movie sure feels like part of that “factory”. Figures follows each and every trope one finds in films of this sort, and it does virtually nothing to break free from that imprint. None of this makes Figures a bad movie, as it manages to push the right buttons. You’ll feel outrage, you’ll feel anger, you’ll feel inspiration, you’ll feel hope – all the emotions this sort of tale wants you to experience. I just wish all this didn’t seem so predictable and conventional. Thoroughly professional, Hidden Figures offers an enjoyable story with an uplifting impression, but it achieves its goals in such a trite manner that I think it disappoints. This movie could’ve been a lot more challenging than this one-dimensional “feel good” fare. 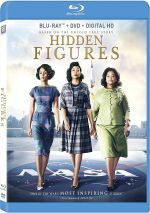 Hidden Figures appears in an aspect ratio of approximately 2.39:1 on this Blu-ray Disc. This became a good but slightly inconsistent presentation. Sharpness became the main up and down element, as some soft shots appeared at times. These didn’t dominate, so most of the film looked well-defined, but a few oddly iffy bits occurred. No issues with jagged edges or moiré effects popped up, and I saw no signs of edge haloes or print flaws either. Even with its period setting, Figures opted for a predictable teal and orange palette. While those choices felt trite, the Blu-ray reproduced them as intended. Blacks looked deep and rich, and outside of a couple of dense “day for night” shots, low-light elements boasted good clarity. All of this created a mainly satisfying image. Due to the story’s character focus, I didn’t expect much from the film’s DTS-HD MA 7.1 soundtrack, but I found a fairly engaging mix. Most of the movie focused on music and general ambience, and those domains provided a nice sense of the material. A few more dynamic sequences added zest to the proceedings. A thunderstorm brought out the expected involvement, and scenes with rockets and other technical elements added zing to the mix. These didn’t pop up with great frequency, but they connected well when necessary. Audio quality worked nicely. Speech seemed natural and concise, while music was warm and full. Effects showed fine clarity and impact, with deep low-end as appropriate. I felt pleased with this well-executed soundtrack. As we shift to extras, we start with an audio commentary from writer/director Theodore Melfi and actor Taraji P. Henson. Both sit together for this running, screen-specific look at the source material and its adaptation, story/characters, cast and performances, sets and locations, music, and factual elements. From start to finish, Melfi and Henson provide a thoroughly pedestrian commentary. They give us basics about the production and no more than that, as we find a lot of praise and repetition of on-screen action along the way. Though not a worthless track, this one lacks a lot of substance. “Adds” discusses female/African-American involvement in US air flight history and background for the film, story/characters and the project’s path to the screen, cast and performances, cinematography and production design, and music. “Adds” can be a fluffy overview of the production but it brings us enough substance to merit a look. Filming in Georgia lasts five minutes, 15 seconds and involves Melfi, Costner, Henson, Parsons, Spencer, Williams, Thomas, Monae, location manager Wes Hagan and executive producer Kevin Halloran. They tell us about the movie’s locations and how awesome it was to shoot in Georgia – with an emphasis on the latter. Though we get some minor insights, this mostly feels like an ad for the Georgia film commission. Eight Deleted Scenes fill a total of 10 minutes, 14 seconds. These tend to focus on supporting characters, so they add a little depth but not anything memorable or especially meaningful. We can view the scenes with or without commentary from Melfi. He gives us background for the sequences and lets us know why he cut them. The director offers efficient and useful information. A Gallery features 27 stills. These mix production photos and shots from the set. It becomes a mediocre compilation. The disc opens with ads for Step, Mars, and Jackie. Sneak Peek adds promos for Rules Don’t Apply, The Birth of a Nation (2016), Miss Sloane and The Martian. We also find the trailer for Figures. A second disc provides a DVD copy of Figures. It includes the same extras as the Blu-ray. Does it count as ironic that a movie about challenging the status quo provides a wholly conventional, predictable affair? While I like the story and message of Hidden Figures, the movie lacks much creative zest, as it conveys its narrative in the most traditional manner possible. 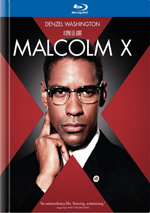 The Blu-ray brings us largely good picture and audio along with a decent set of bonus materials. Hidden Figures presents crowd-pleasing entertainment with little daring or risk involved.